I have struggled my entire life with my weight. A friend took my before picture of me in 2008. I saw it and started crying. I am lucky enough to work where there is a small gym, so I started going down on my lunch breaks and walking on the treadmill. After that I started counting calories, and then did Weight Watchers. 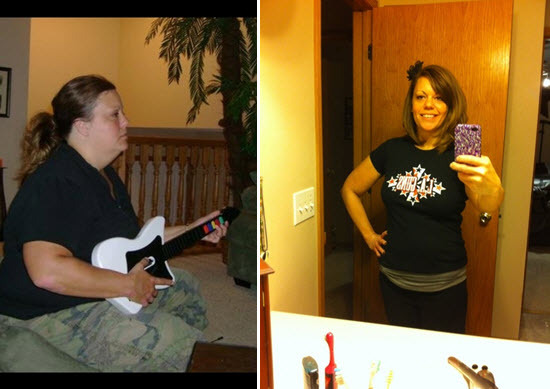 I was 255 pounds and lost 80 pounds over the course of a year. I kept it off for about a year but then started getting depressed and fell off the wagon. I was being too strict all the time and then I would lose control and binge. I gained back up to 218 pounds. Last April my ex husband and I separated and I got angry. I started working out harder and smarter. I jogged every other day and hit the gym on opposite days which I still do now. I eat what I want within reason, avoiding breads and fried foods. I LISTEN to my body now and if I really want a hamburger or a cookie, I have one. It seems to be the trick for me. Now I am down an additional 17 pounds from my original weight loss. I still would like to lose 10-20 pounds but this time I am not obsessed completely and I am taking my time to get where I want to be. I am much happier and I know I won’t go back to where I was because it feels too good to be able to run and move and have energy!